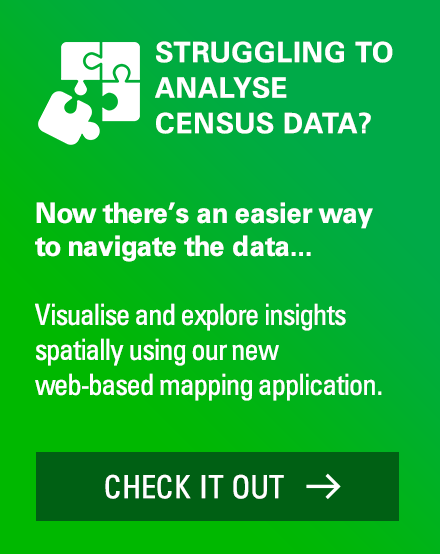 With the release of the latest population figures from the ABS this week, Glenn gives us the highlights, including a map showing which local government areas are most affected by population changes and a summary of the fastest growing areas, as well as places in population decline. Sydney is just hanging on as Australia’s largest city, while Camden Council takes the crown as the fastest growing LGA in Australia. Darwin and regional Western Australia continue to decline in population, while Melbourne booms in the city and on the urban fringe. 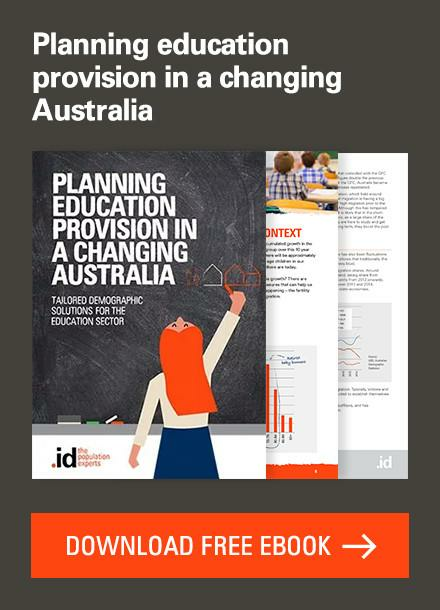 These are a few of the headline findings from the release of Regional Population Growth, 2017-18, the ABS’s annual update of population numbers for areas smaller than states. You will be able to see these figures in your local community profiles soon, our Community and Economic profiles soon after release, and these numbers are also subject to revision after the next Census. But for now, they give us the best handle on what’s happening at a local level in terms of population. 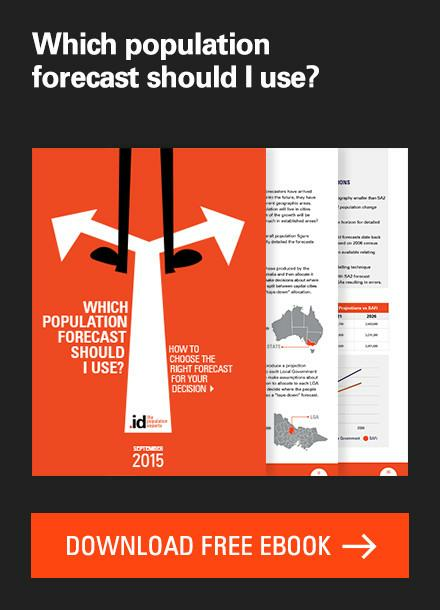 Where is Australia’s population growth happening? The following map shows how population changes are affecting Local Government Areas (LGAs) in the different regions of Australia. What are the fastest growing cities in Australia? Capital cities continue to make up the lion’s share of Australia’s population growth, 79% of the growth of 391,000 people in the year fell into the state capitals and Canberra, with 65% being in Greater Sydney, Brisbane and Melbourne. Despite this, Darwin recorded a population decline, down by 355 people to 148,564 people. 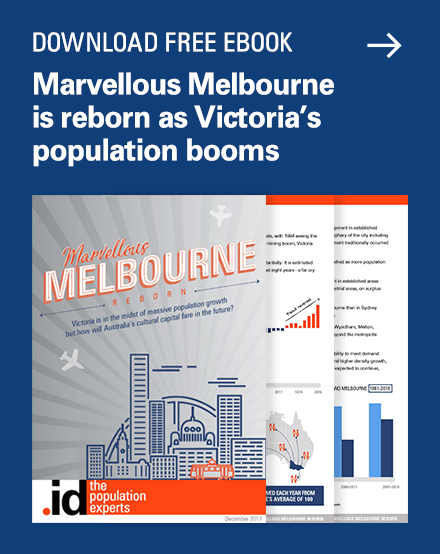 Greater Melbourne added 119,421 people, around 31% of Australia’s total population growth, while it contains around 20% of the total population (4,963,349). Melbourne’s growth has slowed a little from 2.7% to 2.5%, but is still growing very strongly. In the same time, Greater Sydney added 93,400, or 1.8%, to sit at 5,230,330 people. This is still Australia’s largest city, but Melbourne continues to close the gap. 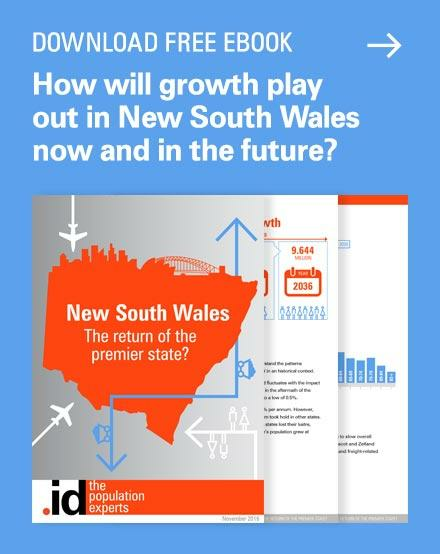 It is only 5.2% smaller than Sydney and if the current growth differential continues, it should overtake Sydney within the next 10 years. Of course, it always depends where you draw the boundaries. See my blog on this issue. Brisbane added just over 50,000 people, reaching 2,462,000. 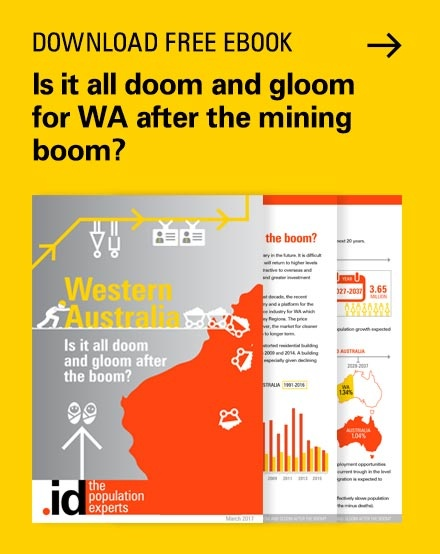 Growth in SA and WA was almost entirely in Adelaide and Perth respectively, with regional SA only adding 1,160 people, and regional WA declining by over 500. Adelaide stands at 1,345,777, while Perth is 2,059,484. In Tasmania, the growth was fairly evenly split between Hobart and regional Tas, with Hobart reaching 232,606 people. Everyone wants to know the fastest growing area in Australia. Well, in a sign of the shift of population growth back to the Eastern States, Serpentine-Jarrahdale has lost this title. Camden in NSW, adding 8.0% in a year, or 7,013 people, takes the crown this year as Australia’s fastest growing local government area. This is followed by the City of Melbourne (6.8%), Wyndham (5.9%) and Melton (5.4%) all in Melbourne, then Serpentine-Jarrahdale WA (5.4%). 6 of the top 10 are in Victoria. The 6th fastest growth is one you might not expect – and it shows that percentages aren’t really everything, and depend largely on your starting population. The tiny Aboriginal community of Maralinga Tjarutja added 3 people* to have a population of 64. This is a 4.9% increase, making it the 6th fastest growing LGA in Australia, and by far the fastest in SA! When we look at growth in raw numbers, it’s a different story. It’s always the City of Brisbane which has the largest growth – because it’s about half the Brisbane metropolitan area and by far the largest LGA by population in Australia. 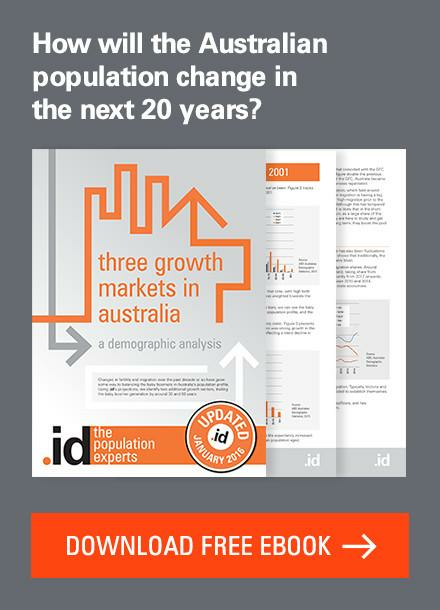 The 22,942 people it added only constitute 1.9% population growth – close to the Australian average. Followed by the Gold Coast (+15,633, 2.6%), and Wyndham in Victoria (+14,251, 5.9%). The City of Wyndham has the distinction of having the 3rd fastest AND the 3rd largest growth of any LGA. 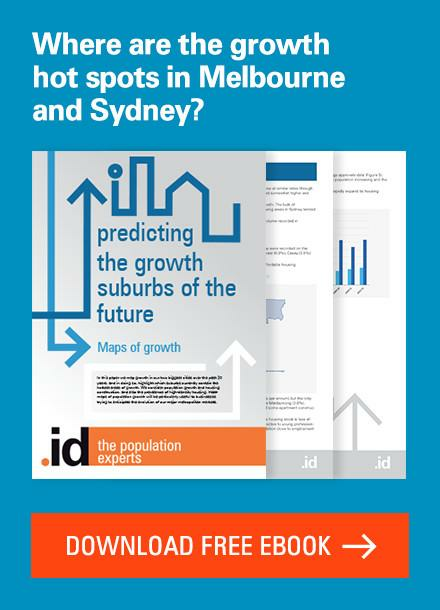 Which Australian cities are declining in population? The list of declining LGAs is dominated by outback Western Australia and, to a lesser extent, Queensland and South Australia. The wheatfields LGA, The Shire of Cue, tops the list in percentage terms, falling by 16%. In raw numbers, however, the City of Darwin had the biggest decline in the nation, down by 1,337 people. It’s 2019 – why are we looking at 2018 figures? As with all data from the ABS, there is a delay between the date of collection and the date of release, as the ABS obviously have to collate and prepare these data for output. All the figures in this report relate to the population as at June 30th, 2018. We are in the process of updating all our client sites with the latest year’s data. Register for access to our full directory of community profiles here, and don’t forget, it is subject to review down the track, particularly with the next Census in 2021. While we’d typically caution you to take such small numbers with a grain of salt, when we looked at the component of population change in this instance we saw the increase had been attributed to ‘natural increase’. In other words, this increase probably correlates with three additions to the births registry from the Maralinga Tjarutja community. Stay tuned for a follow-up blog Glenn is writing about how the ABS calculates these changes to the population between Censuses. Awesome post! I am in the Kimberley region (regional WA), which experienced an overall decline of 0.3%. Being in a remote region, it is always tricky to rely on boom times in the economic cycle to attract and/or retain internal and overseas migrants to the region. In the long run, I think most of our potential for population growth lies in the natural increase (which here is propped up by the Indigenous component of the population, nearly 50% of all residents). It is excellent that the ABS now breaks down the components of population growth, this certainly gives further insight into the dynamics of growth (or decline!). I look forward to the post Glenn is writing about how the ABS calculates changes to the population between Censuses. As a small Business owner and local employer – I look forward to these updates to help me plan for the future. Great information and constructive analysis.